Our lives can often be dramatic with very high highs...and very low lows. So it's often days like today that I treasure. Just an ordinary "according to schedule" day. One of my favorite times of the day is picking Brian up from preschool. Brian loves school...and his teachers and friends love him. He's happy to say goodbye in the morning...and he's happy to see me two and a half hours later when he walks out. Typically when he spots me he comes running and, I swear, it's such an ego trip. He runs up with his arms spread wide saying "MOMMYYYYYYY!!!!!!!!" and jumps into my arms. Really - can it get any better? I always have a nice cold milk waiting for him in the cup holder and we drive home talking about his morning. I treasure that time in the car with him. Today was Gavin's double therapy day. His teacher, Miss Janna, came first and they worked on color matching, worked with play dough and used the iPad. Miss Maggie followed with speech therapy and continued to work with the iPad. We had a lovely visit today from our very own Miss Katja!! The boys and I were so happy to see her. She stopped by on her way to work at our neighbor's house and we had a nice time chatting. 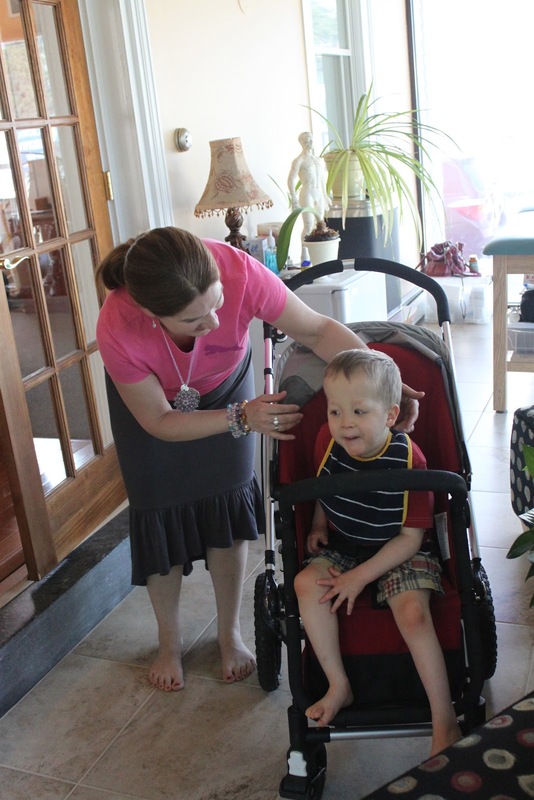 She stopped by again with one of the little boys she watches during Gavin's therapy. Miss Sara and Brian decided to join them on a walk! What a sight to see two of my favorite girls hanging out and (trash talking me) spending time together. *wink* In all seriousness, it makes me so happy that we have such good relationships with our helpers. These girls become like daughters to me. 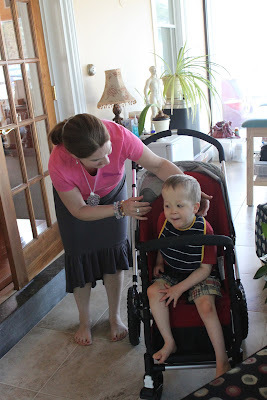 After Gavin's therapy, the two of us took off for our joint Dr. Trish appointment. Gavin is always happy to see her and to be in her office. She worked on both of us for a long time - we needed it! Between my swollen, bruised and stitched up face...and Gavin's swollen tonsils and adenoids...we were a wreck! She tried to calm a lot of the swelling in Gavin's throat and told me to let her know if his sleep improves over the next few days. Fingers crossed! It's so hard to articulate how much I love Dr. Trish. She's so special to us. This photo is a good example of what Gavin's treatments look like. She barely touches him! I got word today that our donor will be taking her HCG trigger shot - which will induce ovulation. Her egg retrieval will likely be this weekend. My embryo transfer could be either June 5th or June 7th. If it's June 7th I will be so happy - it's my parent's wedding anniversary. My Mom and I were talking tonight about how cool it would be if I "conceived" on that special day. I'm feeling very lucky right now...and in a very good place. Ed and I are relaxed from our trip...Brian is doing so well in school and with his speech...Gavin continues to make progress despite health issues here and there...and we are nearing the end of our fertility journey. I always thought the end of our journey to have a third child would only feel good if we had a baby. But now I feel differently. Although I'm sure I'll be disappointed if I don't get pregnant - I know in my heart it's the end. Pregnant or not, I walk away knowing that we tried. And I walk away feeling so grateful. Grateful to have my children. Grateful to have had time with my daughter. Grateful to have had a supportive husband through all of our fertility trials and tribulations. And grateful that all of you have walked beside me on this journey. It hasn't been easy - and I had to find my own way and do things in my own time. But I know I couldn't have done it without all of you. So...here we go. This is it! In less than a week I'll be soliciting your positive thoughts for one tiny little embryo for the very last time. Very bittersweet. I'm praying already.